The state Department of Environmental Conservation is again extending the public comment period on a proposal by an oil terminal operator at the Port of Albany to build a facility that would heat crude oil for shipment, the agency said Wednesday. Global Partners handles crude oil from incoming oil tanker trains that carry crude daily from the Bakken fields of North Dakota. Opponents of the heating plant fear it would be used to process Canadian tar sands oil, a thicker type of crude that thickens in cold weather, making it difficult to pump out of rail tankers and into tanks for eventual transfer to barges and tankers that go down the Hudson River. The company applied to DEC for the heating project last year, and nearby residents have since grown increasingly vocal over safety concerns in light of a national spate of derailments, explosions and fires from crude oil trains, including one in Canada a year ago that killed 47 people. There have been four such derailments in New York since then, but none involved explosions or spills. Such accidents have sparked fears among residents of Albany's South End, where the port is located. There, rail cars are stored close to residential areas, including the city-owned Ezra Prentice Homes housing project on South Pearl Street. This is DEC's fifth extension of the Global comment period, which was most recently set to expire Friday and now has been bumped to Sept. 30. It was initially set to end in December, then January, then April, then June, and then August. A Global spokeswoman issued a one-sentence statement that said the company looked "forward to continuing to participate in DEC's public process." Chris Amato, staff attorney for the environmental legal group Earthjustice and a former DEC deputy commissioner, said the latest DEC delay "was not entirely unexpected." Earthjustice represents tenants at Ezra Prentice Homes, as well as the environmental groups Sierra Club Atlantic Chapter, Center for Biological Diversity and Waterkeeper Alliance. Earthjustice has commenced legal action against DEC for allegedly not doing an adequate environmental review of the proposal before issuing a draft permit to Global. As public pressure built, the state in March demanded that Global answer some 20 questions about fire risk, evacuation plans, spill response and insurance coverage for accidents. DEC also warned it could yank its November ruling that crude heating would have no negative impact on the environment — a step that would trigger a much more detailed state review. "There is clearly a lot of crucial, basic information that has not been provided by Global," said Amato. That includes a so-called "public participation plan," a document from Global that would spell out how it would engage the community around the project. Also Wednesday, Albany County launched a telephone hotline for residents to report "strong odors at local rail terminals and the Port of Albany," said Peter Iwanowicz, chairman of the county Expert Advisory Committee on Crude Oil Safety. The number to dial is 211. The committee also named new members, including County Legislator Lucille McKnight, who represents Albany's South End; Anne Pope, director, regional head of the NAACP; Charlene Benton, president of Ezra Prentice Tenants Association; and Amato. A DEC news release on Global said the comment period was extended again "due to broad public and community interest," the same language that was used in earlier extensions. It could not be determined how many comments DEC has received on the plan so far, as calls to DEC for further information beyond the press release were not returned. The agency "will continue to work with community leaders to coordinate on a public participation plan and any further requests deemed necessary to supplement information Global provided to go along with its application," according to the press release. 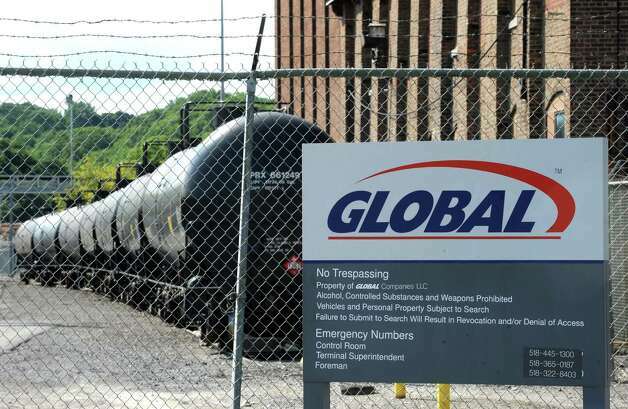 In May, Global wrote a 32-page letter to the DEC with responses to the agency's March questions — and to contend that the DEC would be overstepping its bounds by linking the project to larger questions about the safety of surging rail transportation of highly volatile crude oil through Albany and elsewhere in the state. Global also challenged the usefulness of a DEC plan to begin air pollution testing around the port.